Samples for T-cell analysis often contain only small amounts of relevant genomic DNA. As a consequence, prior to sequencing massive amplification by PCR is necessary, which increases the risk of contamination by foreign DNA. HSDiagnomics uses a sophisticated and unique 2-step PCR approach with inbuilt contamination protection, which efficiently eliminates DNA contaminations both during PCR and/or during sequence analysis. Currently, TCRsafe is available as part of our service packages for TCRbeta-profiling, but will be made available at beginning of 2015 as TCRsafe-kit, which will allow customers to perform all sample preparation steps up to the sequencing library in their own lab. Interested customers are welcome to contact us for more details in advance. The kit covers all primers (44 V-segment- and 14 J-segment-primers) for primary and secondary amplification. All primers are carefully calibrated to allow even amplification rates for all possible V/J-combinations. HSDiagnomics addresses these needs by a proprietary mouse TCRsafe service package. It comprises a thoroughly optimized quantitative TCRbeta analysis, which is equipped with the same contamination protection system as the human TCRsafe kit. 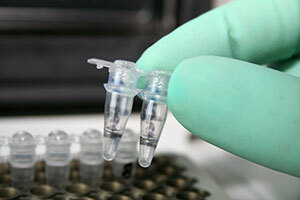 Standard samples (DNA, blood) as well as accurately formalin-fixed and paraffin-embedded tissue can be analyzed. Interested customers are welcome to contact us for more details.